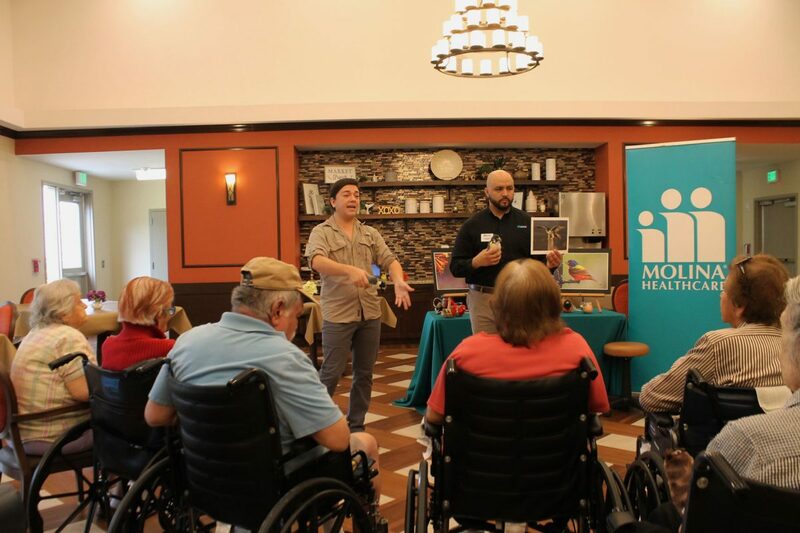 Marco Rangel, Frontera Audubon outreach coordinator, engages the residents about the native bird while Juan Rivera, right, community engagement coordinator, shows the photograph of a bird to the residents during the Bird Tales program at Colonial Manor in Pharr. PHARR — Approximately 20 residents of Colonial Manor nursing home were able to experience nature Friday as the outdoors came inside through an innovative program new to the area. Bird Tales is a multi-sensory stimulation program designed for the residents of mild to severe levels of dementia. The program involves talking about birds native to South Texas in order to stimulate the participant’s cognitive functions of sight, sound and touch through recalling encounters with the birds, the individual characteristics of each bird and the various bird sounds. The one-hour program uses plush birds such as a Baltimore oriole, a cardinal, and a finch along with an 8-by-10-inch photo of the bird for the visual component along with a recording of the bird for auditory stimulation. Molina Healthcare of Texas collaborated with the Frontera Audubon Society in Weslaco for the Bird Tales pilot project. In the South Texas region, 32 rehab and nursing facilities will have the chance to experience the program this month. 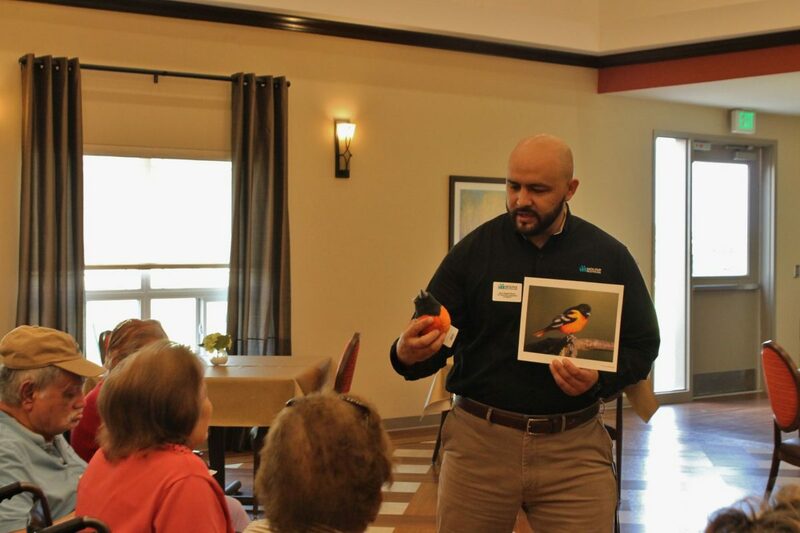 Juan Rivera, community engagement coordinator, shows Colonial Manor residents images of a bird during the Bird Tales program at Colonial Manor in Pharr. Marco Rangel, left, Frontera Audubon outreach coordinator, engages the residents about the native bird while Juan Rivera, right, community engagement coordinator, shows a photograph of a bird to the residents during the Bird Tales program at Colonial Manor in Pharr. Marco Rangel, outreach coordinator for the Frontera Audubon Society, explained that the Bird Tales program involves storytelling and factual history. “This program was a way to bring aspects of the outdoor experience indoors to this specific type of demographic of people living in nursing and rehab centers and is an activity that exposes them to nature and the outdoors,” Rangel said. “It’s very knowledge-based and educational as much as it is therapeutic and sensorial, as well. “They’ll see a photo and immediately it triggers a memory for them (residents) — a happy moment that they experienced or a funny story that they encountered with a type of bird.” Rangel added. Juan Rivera, Molina Healthcare community engagement coordinator for the Rio Grande Valley, said the residents with dementia have reacted in a positive way to the pilot program. Robert Avila, Colonial Manor administrator, praised the program saying it engaged the residents. 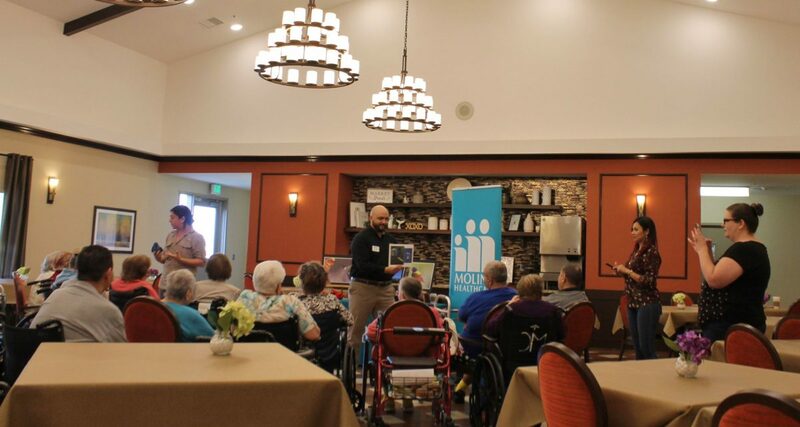 The Bird Tales program was created in 2011 by the Audubon Center at Bent of the River in Connecticut to improve the quality of life for rehab and nursing home residents, and is now being adapted to communities around the nation.